The plan was to wake up early, lodge my visa application, watch The Lucky One, buy a swimsuit or a rashguard, meet up the online seller of Dicapac then go home. I woke up late, 10 AM to be exact, lazed in bed for 30 more minutes, then jumped out when I realized time is running out. I didn’t bring a car because I was too lazy to drive plus the toll fee is exorbitant and I don’t want to get caught in traffic when I can just be sitting comfortably as I daydream about my life. I was in Makati by 12. I decided to have lunch first as VIA, the office where I will lodge my visa application, might be closed as people need to eat since it is supposed to be lunch break. Or so I thought. So buffet lunch it was. It was a so so one from Chef d’Angelo. I realized I changed a lot. I am not enjoying eating out in as much preparing and having home-cooked meals. It must be the age. Then off I went to VIA and lo and behold, my number is 1102 and they are only at 1062 when I arrived. What the? And it takes the clerk approximately 15-20 minutes to sort all the requirements of the applicant. So all my plans went down the drain. My only thought is that I get to be called before the day ends. I don’t want to come back the following day. Que horror! I finished around 4. Thank God. Their office closes at 4:30. That was close. And since VIA is a stone throw’s away (ok… maybe a forceful stone’s throw away) from Greenbelt, I decided to take a walk. Since the sun was directly shining on the pathway that I am walking, I looked for some shade and made some turns here and there. And then I saw the Greenbelt chapel. It is calling me. I went inside and my initial reaction is to look for the Adoration chapel. 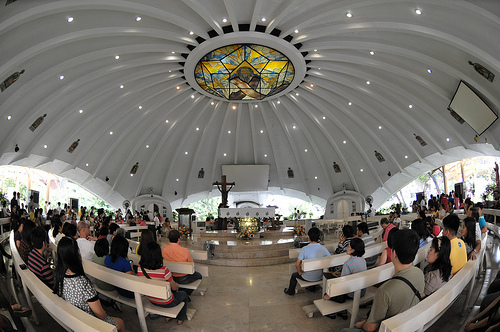 I swept my eyes over the whole building which reminds me of the church in UP Diliman, only this one is a smaller version, but I saw no signs of Adoration Chapel. Then my eyes caught one lady getting out of a door. My eyes failed me and I cannot see the signage of the small room she just emerged from so I stood up and walked towards it. CONFESSION ROOM. Big gulp. I haven’t received this sacrament for several years but I suddenly had the urge to go inside. I did a quick examination of the conscience and then mustered the courage to open that white door. There is a green confession box inside where the priest is hidden and a soft pillow to rest my knees. As I knelt near the confession box, I can see there is somebody inside. He is not stirring nor talking. Errrrrr. So I kept quiet. Then he started to talk sounding pissed. He said I am the one who is supposed to talk and not him. I wanted to run out and forget the whole thing. This arrogant priest! Rarrrrrrrrrrr. But I maintained my calmness and started talking. He butted in from time to time to insult errrrr clarify what I just said. And then I just poured out all my thoughts and I found my eyes getting watery and that’s when the priest started to warm up. He asked me to continue talking. He said I sound interesting. And talk, I did. I told him as much as my brain can conjure. We had healthy debates. “Are you saying that I have a bad attitude, Father,” I asked. No, he said. You have a weird attitude. Try to process things. Look deep within you. What are the things you need to change? Are you really happy? I admire the way you lived your life but life is about balance. You have to mix it yourself to make it more exciting. I am your Devil’s advocate. And on and on our conversation went. I even told him about my lovelife. Yes, we went as far as that. He gave up later on saying we have been talking for too long, almost an hour! He gave me my absolution and wished me well. Then he said, “I will go out of the confession box. I want to see you.” And there came out an old, thin man with smiling eyes. He held my hands not wanting me to put it on my forehead. He wished me well and hoped that we will talk again soon. Father made me so happy. The fact that he acknowledged my weird thoughts and my strict life and how he is attempting to change the way I think is amazing. And wanting to put a face on the conversation made the experience more real. I left the confession room lighter than when I went in. Did I get answers? Not really. Was my mind instigated and fed. Definitely. I hope to meet you again Fr. Blas Briones in Sacred Heart, Kamagong or wherever you may be. You were not supposed to be in that confession box as you only sat for a priest friend who cannot make it that day. And I am not supposed to be in that chapel if not for the sweltering heat that I am trying to avoid. We were meant to meet and talk, Father. Our meetings is God’s Providence as what we both agreed or maybe serendipity if I want to be more romantic about it. Thank you for a wonderful one.